Suit up for classic comedy! When kooky, spooky college profs Peter Venkman (Bill Murray), Ray Stantz (Dan Aykroyd) and Egon Spengler (Harold Ramis) lose their university jobs, they decide to go freelance, de-haunting houses in a new ghost removal service. As soon as they open their doors, their first order of business becomes saving beautiful cellist Dana Barrett (Sigourney Weaver) and nerdy Louis Tully (Rick Moranis), who've inadverten.. When kooky, spooky college professors Peter Venkman (Bill Murray), Ray Stantz (Dan Aykroyd) and Egon Spengler (Harold Ramis) lose their university jobs, they decide to go freelance, de-haunting New York City with a new ghost removal service. As soon as they open their doors, their first order of business becomes saving beautiful cellist Dana Barrett (Sigourney Weaver) and nerdy Louis Tully (Rick Moranis), who've inadvertently opened the..
Ghostbusters makes its long-awaited return with Director Paul Feig's unique and hilarious take on the classic, supernatural comedy, led by the freshest minds in comedy today, Melissa McCarthy, Kristen Wiig, Kate McKinnon, Leslie Jones, and Chris Hemsworth. Together they team-up to save Manhattan from a sudden invasion of spirits, spooks and slime that engulfs the city. Special Features Theatrical And Extended Cut Of The Film, Two Filmm..
Ghostbusters makes its long-awaited return with Director Paul Feig's unique and hilarious take on the classic, supernatural comedy, led by the freshest minds in comedy today, Melissa McCarthy, Kristen Wiig, Kate McKinnon, Leslie Jones, and Chris Hemsworth Together they team up to save Manhattan from a sudden invasion of spirits, spooks and slime that engulfs the city. Special Features Packed With Even More Laughs And Fun Scares! Theatr..
Own Ghostbusters - Logo Mug from Deff, DVD, Blu-Ray & 4K Video Specialists - Free UK Delivery..
Own Ghostbusters - Real Ghostbusters Adventures In Slime DVD from Deff, DVD, Blu-Ray & 4K Video Specialists - Free UK Delivery..
Get ready for some serious "slime-time", with the ultimate Ghostbusters box-set, containing the original classic Ghostbusters and Ghostbusters 2 (Bill Murray, Dan Aykroyd, Harold Ramis) along with Paul Feig's brand-new hilarious take on the classic, supernatural comedy! This time Melissa McCarthy, Kristen Wiig, Kate McKinnon, Leslie Jones, and Chris Hemsworth team up to save Manhattan from a sudden invasion of spirits, spooks and slime ..
Own Ghostbusters / Ghostbusters II / Ghostbusters - Answer The Call DVD from Deff, DVD, Blu-Ray & 4K Video Specialists - Free UK Delivery.. The classic supernatural comedies that defined a generation: Ghostbusters and Ghostbusters 2, together in this special collector's edition Blu-ray set. Celebrate 30 years of the Ghostbusters franchise with remastered high-def picture & sound for movies, plus all-new and never-before-seen special features. Bring home these spooktacularly films that captured the imagination of audiences around the world - and redefined the action-comedy g.. Prepare to spend some quality "slime-time" with Ghostbusters and Ghostbusters II in this double feature set, each with an assortment of other worldly extras. Because when it comes to supernaturally classic comedy, who you gonna call? 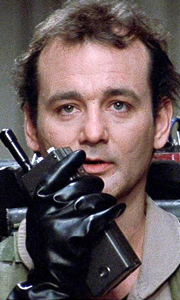 When college profs Peter Venkman (Bill Murray), Ray Stantz (Dan Aykroyd) and Egon Spengler (Harold Ramis) lose their jobs, they decide to go into the freelance Ghostbusting business. Their first job is savi..
Ghostbusters makes its long-awaited return with Director Paul Feig's unique and hilarious take on the classic, supernatural comedy, led by the freshest minds in comedy today, Melissa McCarthy, Kristen Wiig, Kate McKinnon, Leslie Jones, and Chris Hemsworth Together they team up to save Manhattan from a sudden invasion of spirits, spooks and slime that engulfs the city. Special Features Deleted Scenes, 2 Gag Reels, Hilarious Outtakes, Fi..
Gaggles of little green ghosts, spooks and a host of paranormal occurences are on the rampage in New York. Can anyone save the world from these supernatural creatures? Only three unemployed and enterprising university parapsychologists when they go into the "Ghostbusters" business. Bill Murray, Dan Aykroyd and Harold Ramis star as the freelance crusaders who team up as the Ghostbusters squad. Armed with ectoplasmic swats and patented bo..
Ghostbusters makes its long-awaited return with Director Paul Feig's unique and hilarious take on the classic, supernatural comedy, led by the freshest minds in comedy today, Melissa McCarthy, Kristen Wiig, Kate McKinnon, Leslie Jones, and Chris Hemsworth Together they team up to save Manhattan from a sudden invasion of spirits, spooks and slime that engulfs the city. Special Features Jokes-A-Plenty: A Free-For-All, Meet The Team, Visu.. It's a fine time for slime-time when Doctors Venkman (Bill Murray), Stantz (Dan Aykroyd) and Spengler (Harold Ramis) regroup to nuke the spooks in this high-spirited comedy. Sidelined after their spectacular save of New York City five years ago, the heroes of the hereafter once again answer the call when an underground river of ghoulish goo threatens to rot The Big Apple to the core. Dana Barrett (Sigourney Weaver), Louis (Rick Moranis..
Bill Murray, Dan Aykroyd and Harold Ramis take up their proton packs once more to battle the forces of evil in Manhattan! After waging a war on slime that cost New York City millions, the Ghostbusters find themselves out of business - until an ancient tyrant, preparing to return to the Earthly domain through his portrait at the Manhattan Museum of Art, sets his sights on Dana Barrett's baby as the new home for his wicked soul! With the .. In this animated update of the hit motion picture, the Ghostbusters are up to their same old tricks, keeping New York City safe from demons, curses, spooks, and every other off-the-wall weirdness known (and unknown) to mortal man. The team is back- Peter, Ray, Egon and Winston - and this time they have help from their old nemesis Slimer, a new arsenal of weapons, and even an occasional assist from their faithful secretary Janine Melnitz..
Based on the blockbuster films, this action-packed animated series starts a decade after the original Ghostbusters saved New York City from ghosts, goblins and ghouls. All the guys have left town except for Egon, now teaching a Paranormal Studies class at the local university. But Zool, the all-powerful demon, has awakened from hibernation to wreak havoc on the unsuspecting masses. Desperate to recruit a new team, Egon and the plucky Ja..
Own Ghostbusters - Who You Gonna Call Mug from Deff, DVD, Blu-Ray & 4K Video Specialists - Free UK Delivery..